I gave her props for her use of props at the Golden Globes last week. Tonight, I’m giving her props for being best dressed at the SAG Awards. I felt like Emma Thompson finally chucked all the nonsense in the bin and went with something that shows her true personality. Oh, and what a personality it is (with an exclamation mark, please)! She wore a 1930s vintage parrot-encrusted gown from William Vintage (cheeky monkey, since parrot green showed up on more than one red carpet this week). So much talk of old Hollywood glamour, yet no one acknowledged this genuine example of it! I loved the draping at the sides and the fact that it didn’t hit the ground. Emma, at ease. Bet the others were green with envy. Grand dames – laughing it up with Meryl (in Stella). Wait, maybe it was a bird of a different feather. Alas, she didn’t follow the flock. It was so refreshing amongst the mermaids (What? They don’t sing to me…), the sleepy strapless numbers and the usual more-is-more that stylists like to pile on their clients. There was a certain authenticity to it. Where to look – at Ewan or that embroidery? So torn. If you had to describe Ms. Thompson in one word, I think authentic would be a splendid choice. Fun fest: Lupita not letting her off that easy. There’s a Hindi word that always comes to mind when I see Emma, being Emma: shararti. There isn’t a perfect English definition for it, but you could say it’s a combination of mischievous, naughty, silly and playful. 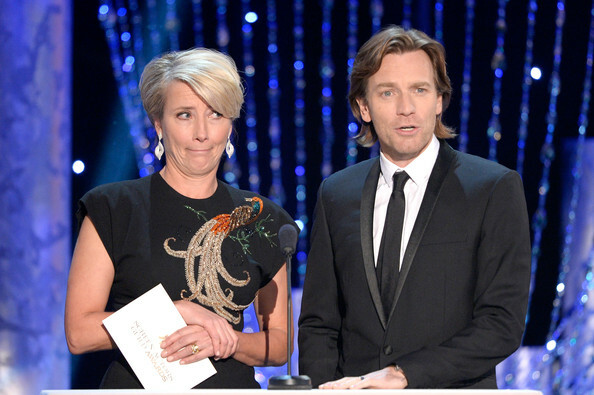 Emma Thompson, you have always been full of both sense and sensibility (not to mention shararat!) for this girl. You opted for sensible tonight, but your style sense did not fall flat. Gold Louboutin flats on the woman whom I thought walked the tallest tonight. More to come on Lupita, Mr. McGregor, other SAG contenders and wanderers of alternate red carpets this past week. 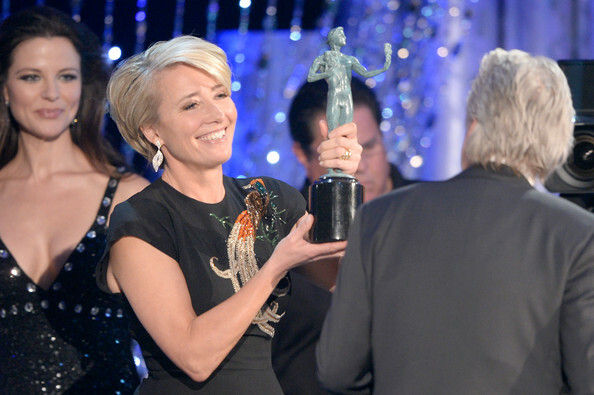 Update Jan 19: Catch up on all SAG Awards 2014 posts and if you missed them, all 2014 Golden Globe Awards posts. 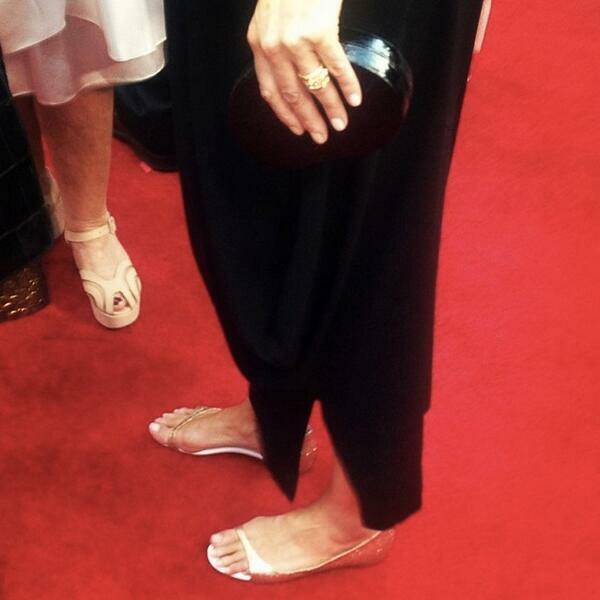 Oh, and Ms. Thompson isn’t the first to walk the carpet in flats. 5. @shefinds; 6. 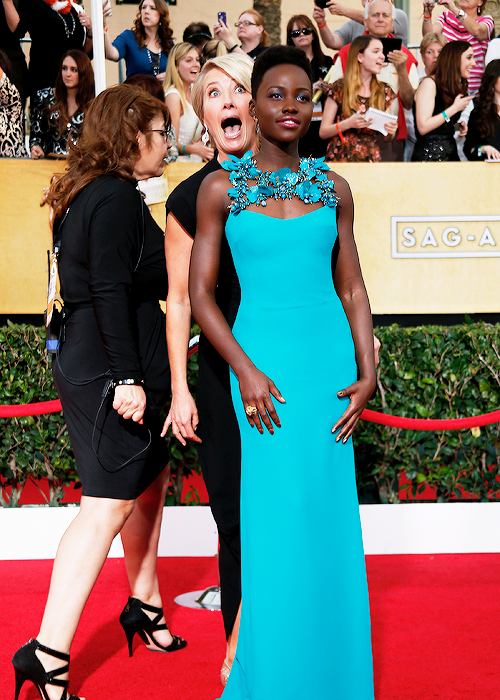 @SAGawards;7. @CNNshowbiz.